"..... why are you using electric outboards instead of inboard motors?" For now, during testing, outboards allow easy access to the small (14 pounds or 6.3 kg) but powerful 10 hp electric motors. They are very light so they can be easily removed and placed inside at a comfortable work height. Also, the outboards get rid of two through hull fittings for each propeller when used as an inboard. One fitting is required for the propeller shaft and the other is for the rudder shaft. There is no desire on my part to have any water leak possibilities in a boat I design. 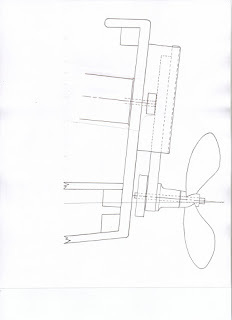 Actually, a future design of an inboard type arrangement is preferred to the current use of outboards or inboards. More on that later. 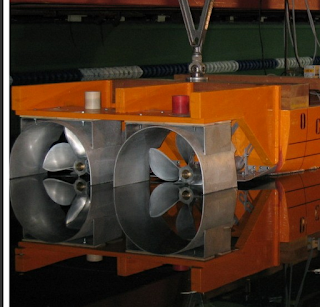 Previously, the MOG electric motors were under the sole of the boat, accessed through hatches. This meant opening hatches and having a hole in the floor where I was also trying to walk. The inboards were aligned and secured to the boat’s framework and to straight propeller shafts, angled down and out through the bottom of the hull, complicating quick tech upgrades, propeller and shaft service when needed. 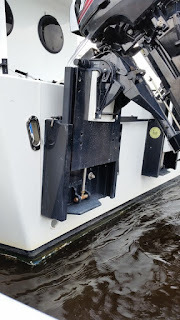 The outboards are light and easy to remove as a whole unit or lift the top motor cover and look inside (my preferred method). This winter I will be tackling the inboard versus outboard debate and feel there are some great solutions that will allow MOG to have the best of both worlds. As usual, technology plays an important part. So if you like outboards, enjoy the view for now…. 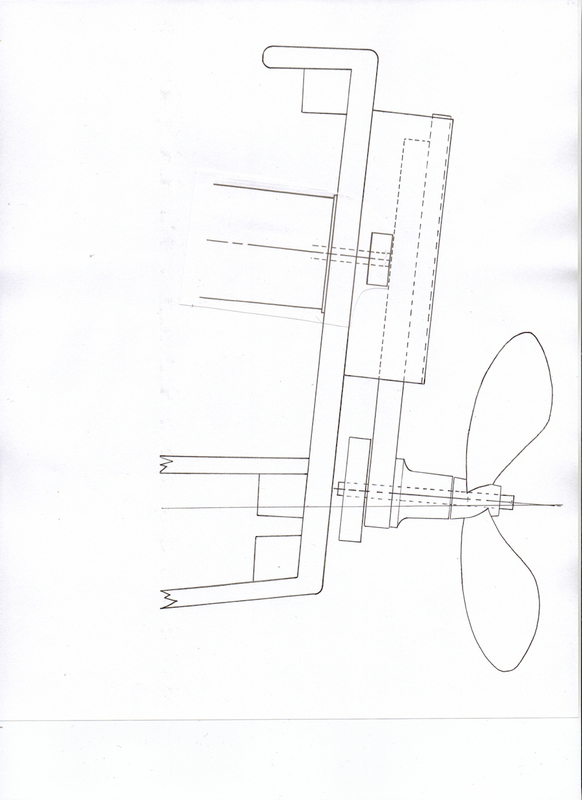 as it is with the MOG…..
A new propeller is being designed as well as the shafting and electric motor placement. Renato 'sonny' Levi is a boat designer par excellence. Having pushed the envelope of fast boats and yachts, he was instrumental in the creation of the surface propeller. 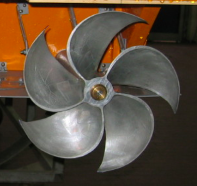 In essence only the bottom portion of a rotating propeller is in the water. Not only does this yield a very shallow draft but it is meant for extremely fast boats of over eighty mph. OK, So is the MOG Totally Solar Electric Drive & Powered boat to be running at 87 mph? Nope. After Sonny had set the speed boat world on fire he decided to proceed full bore in the opposite direction. He would apply the same idea to slow speed hulls and freight ships. Whoa!!! The professors at naval and maritime universities had a fit at his claim of 2 to 5% greater efficiency. Nobody wanted to spring the money or grants to prove such a far fetched idea, even if it was from the mind of a prodigy. After convincing two great Italian universities to try the idea, a model hull for a freighter was fitted with his prop designs. Long story short, his initial projections were proven better than correct. 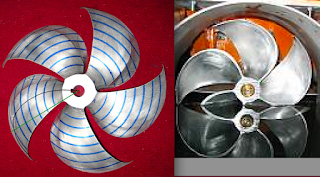 The propeller system was nearly 13% more efficient!! Of course much of that efficiency is due to drag reduction from not using a totally submerged prop, no shaft underneath the hull, no shaft support or rudders dragging in the water. 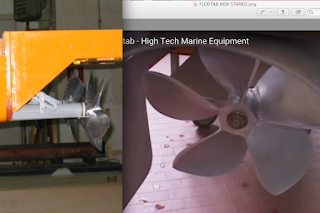 Currently an Italian company by the name of Flexitab has the patents for the low speed prop. So the MOG will be shod with new propellers of similar design and tested for 2016. Not all things are scalable but the propellers used for the large test tank model most nearly match the size needed for the MOG.\, so it is worth a try. An initial radical concept prop by Sonny Levi. A side and aft view of the Levi prop updated after tank testing. Twin counter rotating props of newer design on tank test model's stern. through a flexible belt to the propeller which is half submerged at the waterline. jack plates, after substantial modifications for the new prop and bearings. No doubt there is more to come as progress is made. For now, the candles are burning brightly into each and every night. Good lighting is a main ingredient of a successful trade-show booth. Just the right lighting system can help an artist create the atmosphere of a fine-craft gallery. This will lure gallery owners off the isles and into your booth – the first step toward making a sale.